N8-alike set to get official nod soon, with talk of QWERTY-packing sibling coming too. 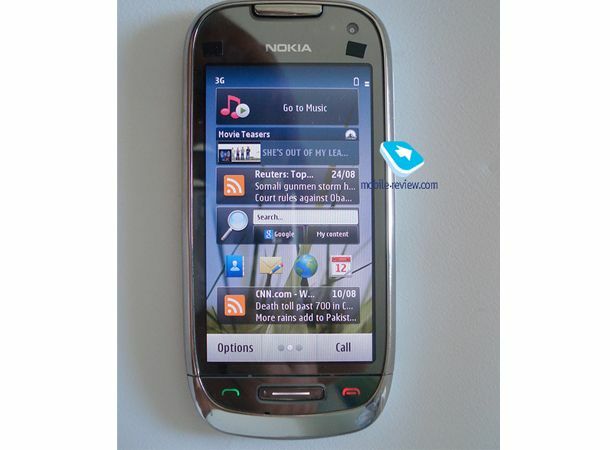 The Nokia C7 has already been spotted doing the rounds. But now Russian mobile fanatic Eldar Murtazin has laid his hands on one, ahead of Espoo's official launch, set for September's Nokia World bash. The new touchscreen effort is the second phone to pack in Symbian 3 after the Nokia N8, and as such is a pared down version of that stellar smartie. It comes with an 8 megapixel camera, rather than 12 and packs in 8GB of storage. Murtazin reckons that while the C7 won't win over any new punters, Nokia fans will be more than happy to stump up for one. And if they're not, there's always the mooted C7-01, which he says will land in early 2011, rocking the same specs, but with a QWERTY slider to boot. Expect the C7 to get official very soon. In the meantime, tell us if you think this, and the Symbian 3-toting N8, are enough for Nokia to mix it with Google and Apple. Head to our Facebook and Twitter pages to get involved.